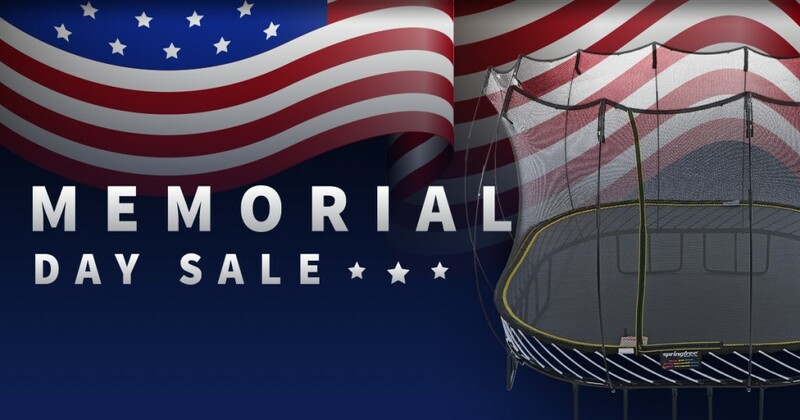 Springfree Trampoline Memorial Day Sale - save up to $548! Home Health	Smarty Alert: Springfree Trampoline Memorial Day Flash Sale – save up to $548! Smarty Alert: Springfree Trampoline Memorial Day Flash Sale – save up to $548! Smarty Alert: For a limited time, save $548 on Springfree Trampoline! Bring home the bounce for Memorial Day with Springfree Trampoline! It’s better than bringing home a puppy! The Deal: Save $548! For only $199, you’ll get delivery, installation, tgoma game system and a FlexrStep when you buy any Springfree Trampoline. Offer ends May 29, 2017. The sun’s out and it’s time to get the kids outside and active! When looking at trampoline options for your kids, safety shouldn’t be an option and Springfree is the only trampoline that has been re-engineered from the ground up. Springfree’s smart, springless design has not only changed the way trampolines work but it has also eliminated the impact areas most commonly related to injuries. Every Springfree trampoline is built to last using only the highest quality materials, so your family will get the same enjoyment, year after year. Right now, save up to $548 when you shop at the Charlotte Springfree store in the Blakeney Shopping Center. Hop on over for a test jump and experience the Springfree difference!